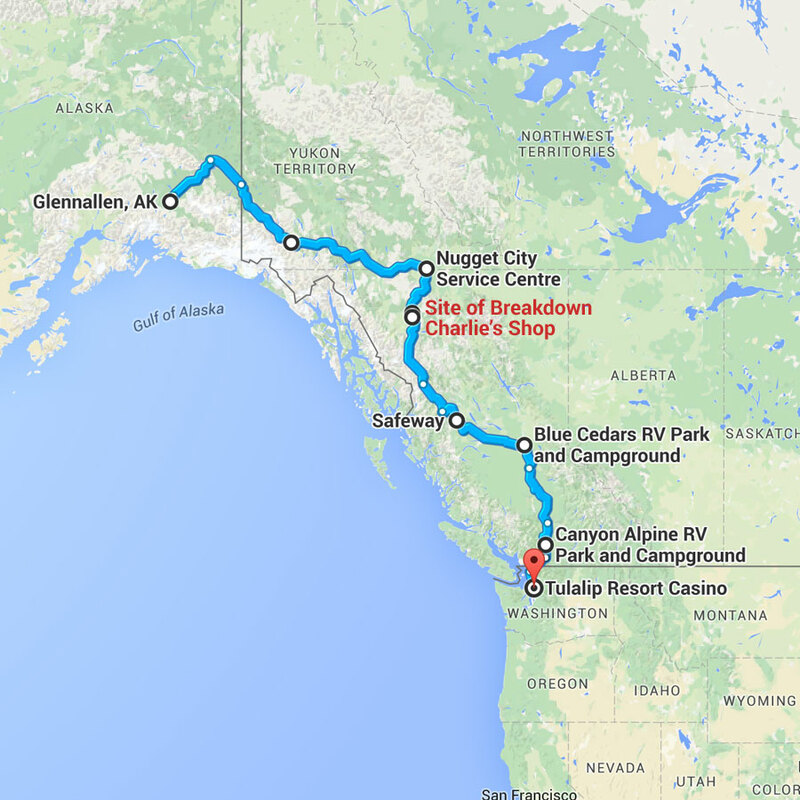 We took eight days to drive from Ferndale, Washington to Fairbanks, Alaska in June. Every one of those days was long, and by the time we arrived, "punch drunk" was the only way to describe our state of mind. So when I tell you we made the return journey in seven days, even with the Mishap, I want you to have some context. It was day three of the drive, and we had made it 919 miles out of the 2,053 total — not quite half way. 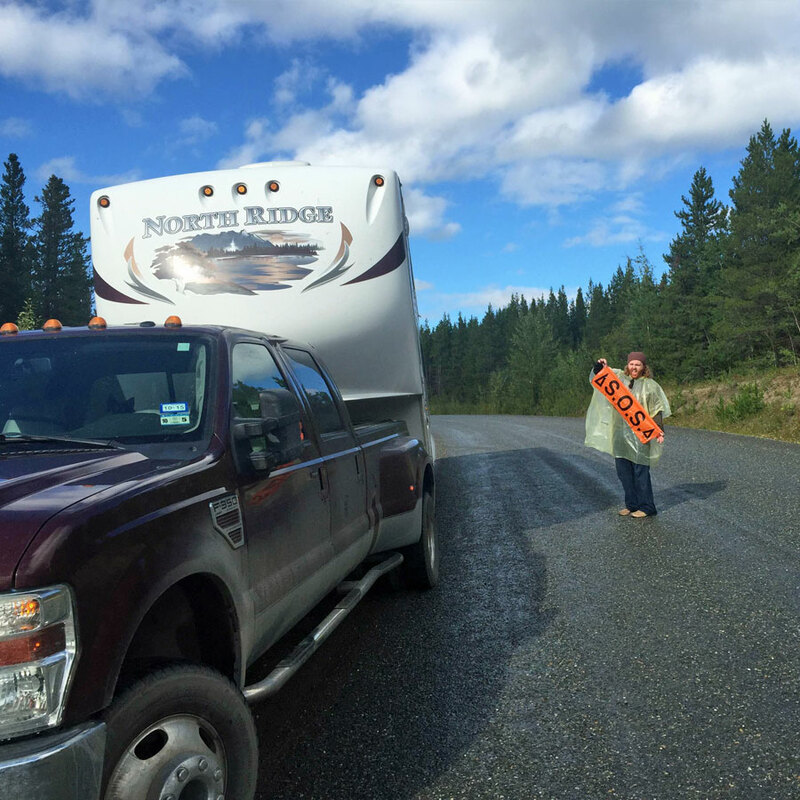 We were on the Stewart-Cassiar Highway, a 543-mile scenic road that serves as the western gateway from British Columbia into the Yukon. We were 137 miles from any town with a population over 1,000. And that's where the Mishap occurred. There was no BOOM! or catastrophic event to warn us that anything had happened. The only sign we had that something was wrong was that our RV was no longer inline with the truck. It kicked out a bit to the right, as if we were turning a corner, even when we were driving straight. Josh and I noticed this at the same time, and he safely brought us to a stop right as the shoulder ended. The good news was we were not moving anymore. The bad news was that we were halfway in the middle of the southbound lane of a two-lane highway, on a blind curve, on a hill, 12 miles from the nearest town, and with no cell phone service. Also, there was smoke coming out from under the RV. Did I mention that? I ran out of the truck towards the RV, opened its front door and grabbed the fire extinguisher strapped there. Fortunately, there wasn't a fire to put out. The smoke we were seeing was from burning rubber. Our RV has a tandem axle, meaning it has two axles right next to each other. 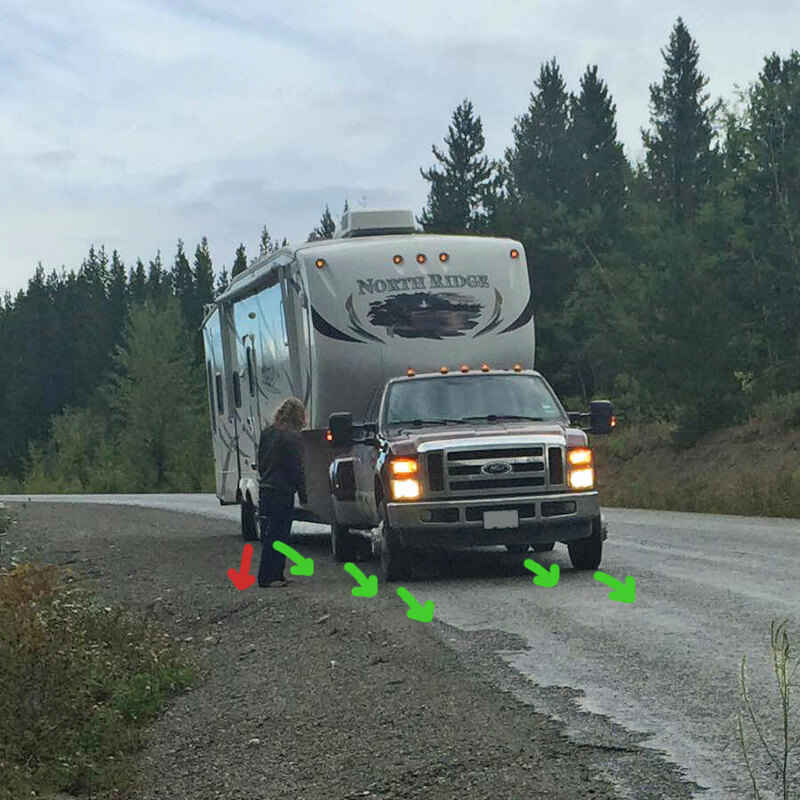 They don't turn; they just enable the RV to follow the truck. In this moment, though, the rear passenger side tire was pointed a different way than its neighbor. Maybe this illustration will help make the problem clearer. Before we could even start to despair, a Class C motorhome pulled up beside us. "Are you alright?" the couple inside asked. "No," was our honest answer. They didn't have a working cell phone either, but they offered to take one of us into the closest town, Dease Lake, to find a telephone and call for assistance. I took them up on the offer, and they brought me to the nearest gas station located on the highway. There, I learned the name of a mechanic — Charlie — and his phone number, but when I tried the payphone, the call wouldn't connect. So the couple with the Class C agreed to drive me to Charlie's shop, two miles into town. It started to drizzle as I hopped out of the motorhome and walked into the shop. Charlie wasn't there, as it turned out. 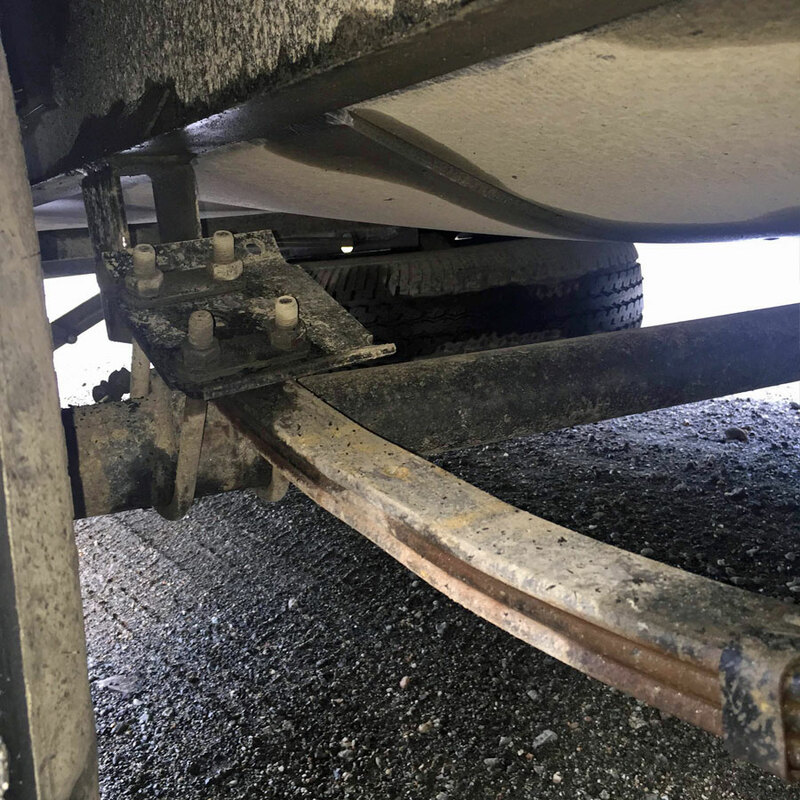 He was on his way back from another job, but the assistant mechanic took my information and assured me they'd be at our RV no later than 8:45 the next morning. With no other options in this town of 300 people, I agreed and returned to the Class C, whose owners drove me back to the gas station. I was so frazzled that I entirely forgot their names, but I'll never be able to forget their generosity. When I offered them compensation for going above and beyond to help me, they vehemently refused it, saying, "Just pay it forward." They were heroes number one and two of the day. "Excuse me, but you wouldn't happen to be heading north?" I can't tell you how many times I asked that question at the gas station. But it turned out most folks were just going home to Dease Lake after a long day of work. Everyone traveling southbound was sympathetic, saying, "Oh, are you with that RV?" but few people seemed to be going north. I saw maybe half a dozen during the whole time I was standing there. For those who were, they regarded me warily. And who can blame them? I was increasingly bedraggled by the rain, wearing an ancient sweatshirt and sporting stringy, unwashed, I've-been-driving-for-days hair. I don't recommend the hairstyle for charming strangers into giving you a lift. Fortunately, after about an hour of waiting, two local workers took pity on me. They were off the clock, but they insisted on going out of their way to bring me back to Josh. "Here, I can help pay for your gas," I offered. "How about some beer money?" I tried. "Company pays for that too." Then, "You thirsty, eh? Feel free to snag a pop back there." They drove me 12 miles up the road to where we found Josh navigating traffic around our still-in-the-way rig. Before the guys left, they helped us back up the truck so we were better situated on the shoulder of the road. They were heroes number three and four of the day. We were advised by some southbound drivers that we should put out cones because we were difficult to see coming around the corner. Knowing we'd probably have to spend the night on the highway partially blocking the road, this seemed like a doubly good idea. Unfortunately, we didn't have any. But right then, a work truck drove up. "Excuse me, can I borrow one of your cones?" Josh asked, flagging them down. The guys looked at each other in confusion, then said, "Okay," and handed him an orange construction cone before driving off. We set up the newly procured cone along with two of our chocks set on their side to warn approaching drivers of our presence. Only later did we realize we didn't catch the name of the business that let us use the cone, so we had no idea where to return it. Right now, hundreds of miles away in Washington, we have a cone marked B.C. for British Columbia in our truck bed. Thanks, heroes number five and six, and sorry! Our RV was horrifically unlevel, but there was nothing to be done about it, so I started rummaging through the pantry to find something we could eat that didn't require turning on the fridge. RV fridges shouldn't be operated when they're unlevel, and a design flaw in our floorplan makes it impossible to open the fridge door when the slides are in, anyway. I found some just-add-water mac and cheese, so I got started making dinner on the stovetop. I had nearly finished when a truck pulled up, and two men got out. One of them was the guy from Charlie's shop, and the other was Charlie, himself. 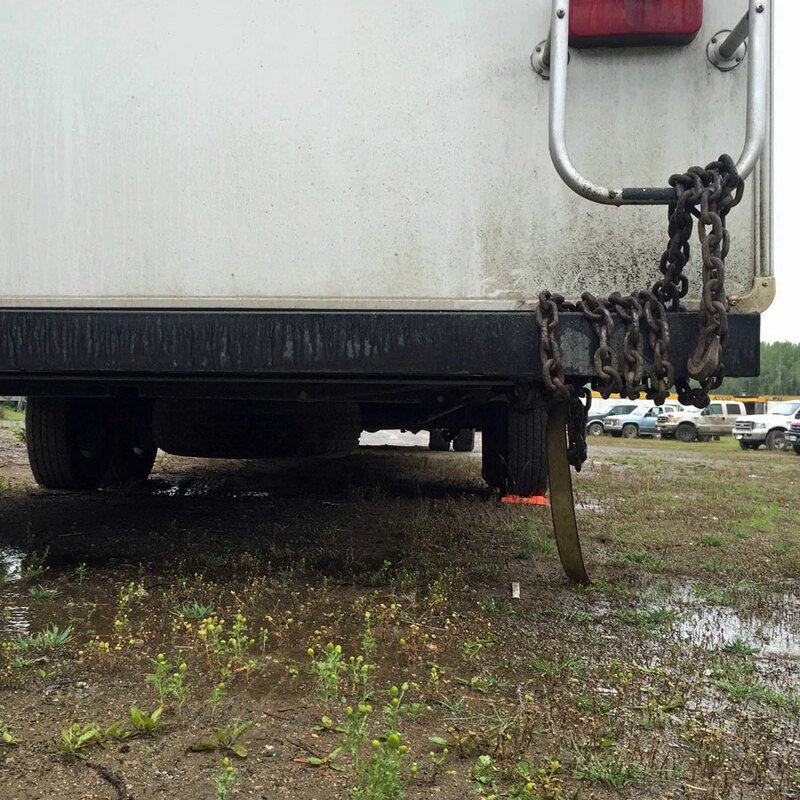 Charlie introduced himself and knelt down by our axle, poking his head under the rig. "Oh!" he said cheerfully. "Sheared your ****ing centerbolt, eh?" 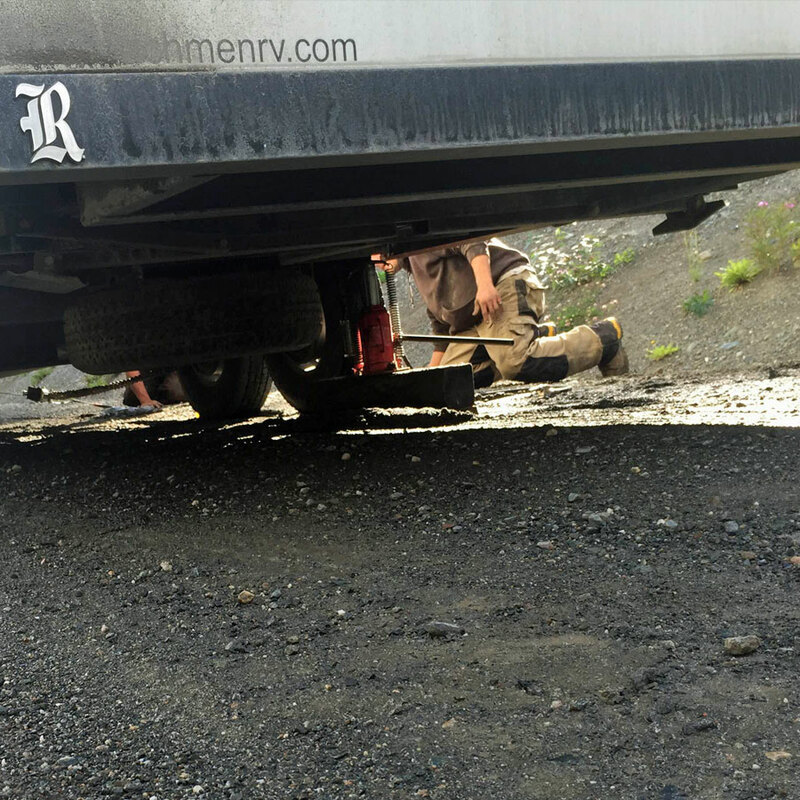 He and his assistant got to work jacking up our RV and straightening out the axle as we wolfed down our dinner. 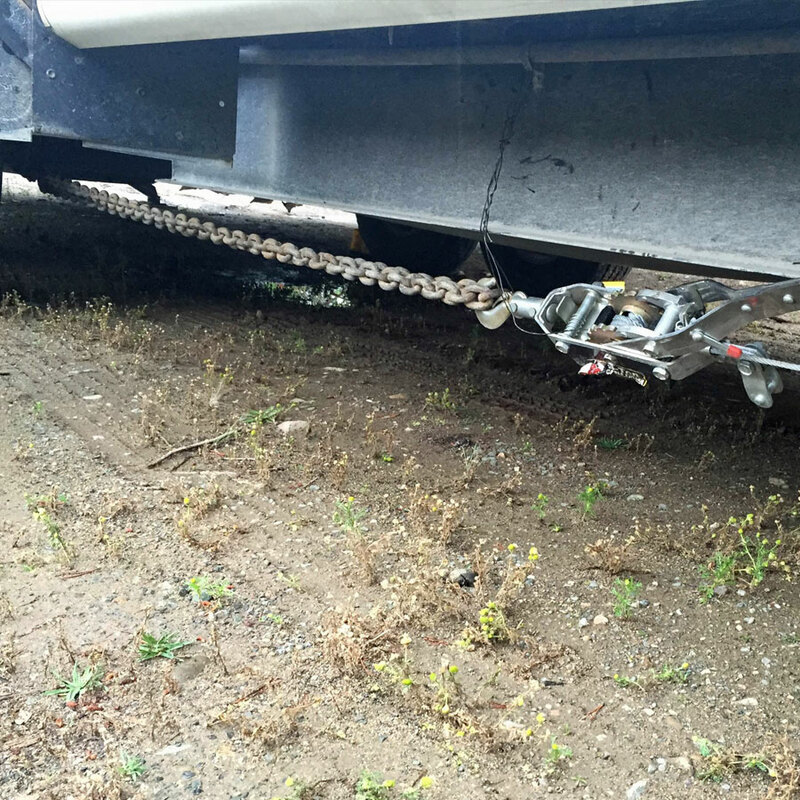 They rigged up a heavy-duty winch called a come-a-long from the front of the RV to the back, forcing the damaged axle to stay inline with its neighbor. We were instructed to drive no faster than 20 or 30 kilometers per hour the 14 miles to Charlie's shop, with Charlie following right behind in his truck. Before long, we were settled for the evening with slides out in a big empty lot. For working well after closing to get us off a dangerous curve for the night, Charlie and his assistant were heroes number seven and eight of the day. The next morning, Charlie wheeled us into his shop, gave us the use of a loaner car and suggested we drive into town to enjoy breakfast at an internet cafe where we could reach out to our family and clients to let them know we were safe but falling a little behind schedule. 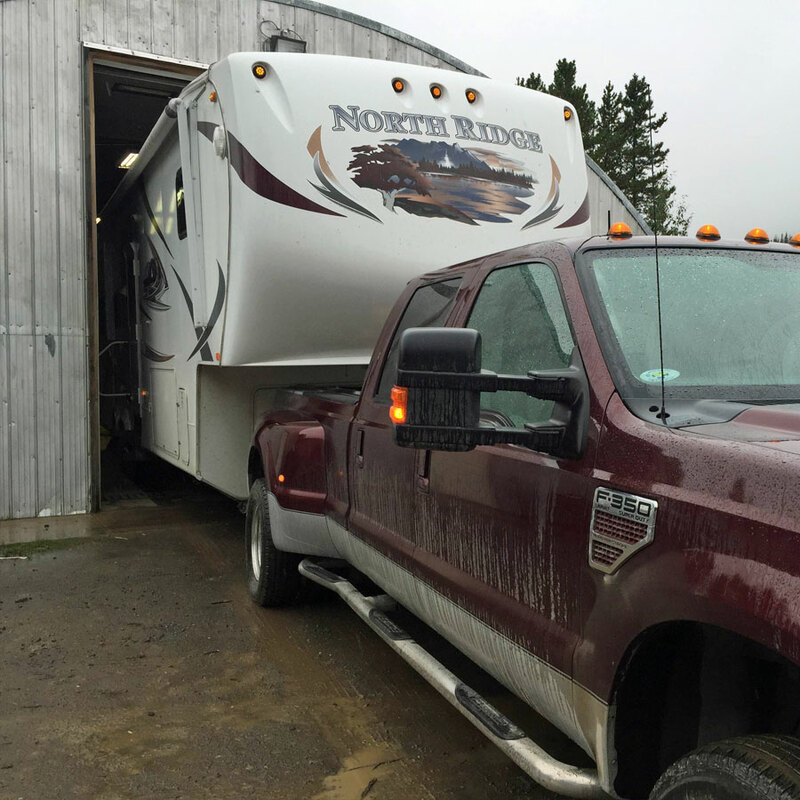 Because this isn't an uncommon break for RVs on these rough northern roads, Charlie had everything needed to fix our RV in stock. In just two hours, we were ready to roll, facing a repair bill that was amazingly reasonable. If any of you heroes should ever read this post, know that we can't adequately express how grateful we are for your help that day. Each of you made a world of difference. And if any of you reading this should be thinking, "See, this is why we can't RV or travel to remote places," just remember that even when things look pretty bad, there will be bright spots, and a stranger or two may come through for you, too. And what is life without a little adventure, anyway? Have you had any wild breakdowns? Tell us your story in the comments below.